Today I’m thrilled to have Victor Cheng on the show. Victor is someone who I met at Billy Murphy’s annual retreat. He’s a former McKinsey consultant, a Stanford graduate, and he’s been on tv a number of times on Fox Business and MSNBC. Victor advises CEOs of small businesses and Inc 500 companies and is well known for his website CaseInterview.com where he teaches others how to get jobs in the consulting field. 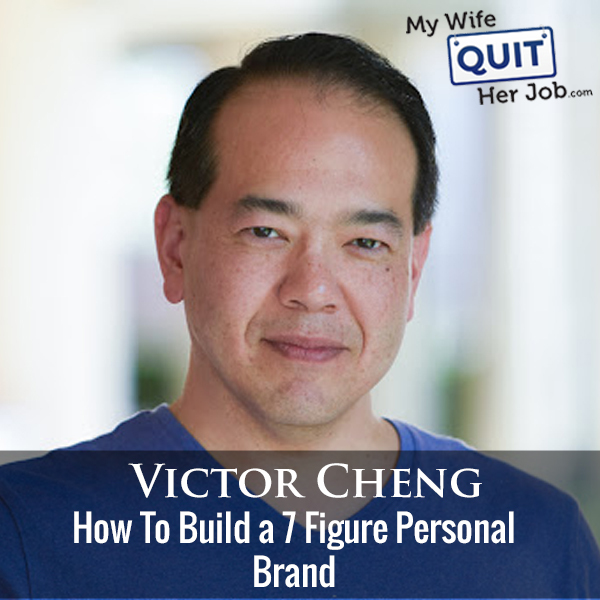 In this episode, Victor shares many of his secrets to building a personal brand including special tips on how to win any argument. Enjoy the show! Steve: You’re listening to the My Wife Quit Her Job Podcast, the place where I bring on successful bootstrapped business owners and delve deeply into the strategies they use to grow their businesses. Now today I have my buddy Victor Cheng on the show. And Victor is a fellow Stanford grad who has turned one of his specific skills that I would never have thought would be monetizable into a successful online business. And we also talk about how to build a personal brand and the difference between EQ versus IQ. But before we begin, I want to give a quick shout out to Klaviyo for sponsoring this episode. Always excited to talk about Klaviyo because they are the email marketing platform that I personally use for my ecommerce store and I depend on them for over 35% of my revenues. Now Klaviyo is the only email platform out there that is specifically built for ecommerce stores, and here is why it is so powerful. Klaviyo can track every single customer who has shopped in your store and exactly what they bought. So let’s say I want to send out an email to everyone who’s purchased a red handkerchief in the last week, easy. Let’s say I want to set up a special auto-responder sequence to my customers depending on what they bought, piece of cake, and there is full revenue tracking on every email sent. Klaviyo is the most powerful email platform that I’ve ever used and you could try them for free at mywifequitherjob.com/K-L-A-V-I-Y-O. Once again, that’s mywifequitherjob.com/K-L-A-V-I-Y-O. I also want to give a shout out to Privy who is also a sponsor of the show. Privy is the tool that I use to build my email list for both my blog and my online store. Now, Privy is an email list growth platform and they manage all of my email capture forms. And in fact, I use Privy hand-in-hand with my email marketing provider. Now, there are a bunch of companies out there that will manage your email capture forms but I like Privy because they specialize in e-commerce. Right now I’m using Privy to display a cool wheel of fortune pop up. Basically a user gives their email for a chance to win valuable prices in our store. And customers love the gamification aspect of this. And when I implemented this form email signups increased by 131%. I’m also using their new cart saver pop up feature to recover abandoned carts as well. So bottom line, Privy allows me to turn visitors into email subscribers, which I then feed to my email provider to close the sale. So head on over to Privy.com/Steve and try it for free. And if you decide you need some of the more advanced features, use coupon code MWQHJ for 15% off. Once again, that’s P-R-I-V-Y.com/Steve. Now onto the show. Steve: Welcome to the My Wife Quit Her Job Podcast. Today I’m thrilled to have Victor Cheng on the show. Now Victor is actually someone who I met at Billy Murphy’s mencation. And I’m really glad that I did because he’s got some really interesting experiences to share. He is a former McKinsey consultant. And like me, he is a Stanford grad, go Cardinal. And he frequently advises CEOs and small businesses and Inc 500 companies. He’s been on TV a number of times on Fox Business and MSNBC. He’s also the author of a bunch of books, including Extreme Revenue Growth, The Recession Proof Business, and Escaping the Self-employment Trap. And he’s also well known for his website CaseInterview.com where he teaches others how to get jobs in the consulting field. Overall, Victor has accomplished so much that to be quite frank, I’m not even sure where to begin with this interview. But let’s start with an intro. Victor, welcome to show how are you doing today, man? Victor: Thanks Steve. Thanks for having me on. I appreciate it and feel very honored. I’m doing great and excited to talk about a wide variety of topics. Steve: So Victor, let’s start with your story in case people don’t know who you are, of how you went from McKinsey consultant to advisor to author and to the owner of CaseInterview.com. Victor: Yeah, so many years ago, more years than I care to remember, I graduated from Stanford, got recruited into one of the top consulting firms McKinsey, was there for a couple years. I was sort of a rising star at the time, and decided too that really wasn’t for me for the long haul. This was back around the dot com boom, around the year 2000. And decided to leave and start my own company and sort of went down this very windy, entrepreneurial path for a couple of years, worked for some big startups for a couple of years in tech, and sort of worked myself again. So I would say over the last, I guess 25 years or so if I can count correctly, I’ve been working on my own for probably about 17 of those years. Steve: Oh, wow. Okay. I didn’t realize it was that long. Victor: Yeah, yeah, three different iterations starting in 98. And I’ve worked for others for probably about six or seven years in consulting and then in the software industry. Steve: Just curious, how did you come to the conclusion that you wanted to be self-employed? Victor: Steve, I was having kids. I was at the time, yeah, I was an executive in a tech software company. And that’s since been bought by Oracle. I was traveling 50% of the time, I was on a path to really becoming a CEO of a tech company at some point, was sort of the momentum of my career trajectory at the time. And we had our first kid on the way. I’m like, I’m going to be a dad, the kind of dad I want to be if I’m traveling literally like 25, 26, 27 weeks a year. And I just didn’t see how that would work. And so decided I just need to be working from home. And then, so jettisoned my career at the time and said start over and like what are my options? And that was the starting point for all that. Steve: So just for the benefit of listeners, Victor and I, we were just chatting before this interview started how we are tutoring our kids in math right now. And Victor spends several hours per day tutoring their kids, which would not be possible, obviously, if he had a full time job. Victor: Yes, yeah very true. So I think a full time job would be easier than pre-algebra. But hey, it’s what it is, right? Steve: So let’s talk about that. So you quit your job. And you decided to build a personal brand, right? Victor: Yeah, I would say I quit my job, I wanted to earn a living. I built a personal brand somewhat by accident, I’m more conscious of that now. But it became a necessity to building up the kind of business I wanted to build. But it wasn’t the goal from the outset. Steve: Oh, it wasn’t okay. So what do you mean by accident? And what was your plan when you quit? Victor: Well, to get clients. So when I quit, I wanted to get clients and customers and I’m very good at selling in person. And the problem was to sell in person in the fortune 500 means jumping on an airplane. So I needed to talk to someone running a billion dollar business, very comfortable in that environment, I could talk to them, but I have to go there. So when I started to work from home with the one self-imposed constraint of not having to get on an airplane anymore, then that meant I can only communicate with prospective customers through direct mail, online or the telephone. And so really, I ended up using the internet as a marketing medium. And it became very hard to get customers unless they knew of you. And so, the building of a personal brand sort of evolved with a desire to be known as a way to get clients. So getting clients was the goal, personal brand became the vehicle for doing that. Steve: Okay, and so what did you start out doing then? How did you do it, what was the process like? Victor: Yeah, I think very early on, I gravitated towards what today would be known as content marketing, in the sense of just helping other people out online. I remember the very first person that I helped out was — this is pre internet years, this was probably like 98. And back then there weren’t really message boards. They were like using that I think forums; I forget the terminology we used back then. Steve: You’re dating yourself Victor but yeah go ahead. Victor: Yeah. Yeah, totally I mean, I was in Stanford when the web browser got invented, right. So I’m ancient, I guess, in terms of [overlapping 00:07:49]. Steve: Actually does that mean we overlapped? I think we overlapped because that was around when I was there too actually. Victor: I finished 95. When were you there? Steve: Okay, I finished in 97. So you only got two years. Victor: Oh okay. All right, so we did overlap. Steve: We just both date ourselves, but go on. Victor: There we go. All right, with geriatric here. And my first taste of it was, I was on this sort of email list serve used net group forum kind of thing and we were talking about business. And I was just sort of riffing on just some — someone asked a question and then I answered it. And my answers tend to be fairly extensive and thoughtful, and particularly in areas I know very well. And then lo and behold, a random person reached out to me and said, hey, I really liked what you wrote the other day. Well, yeah, sure. No problem. Thanks for that. I’m like, no big deal, would love to pick your brain on some other issues. I’m not sure, no problem, I’m having nothing else to do. And so we got on the phone. And turns out the guy was one of the newest billionaires on the Forbes 100 list. Victor: Yes, yes. And he really resonated with – he was sort of eaves dropping on this forum. He had just made the list and he had started a software company, was looking for advice and some help on some I don’t know the topic, some topic I was talking about. And we had a phone call, right? So it’s interesting when people ask like what do you do when you call like a CEO to get a meeting, and get through the rest of system, get through the gatekeeper? And there’s a phone script that works 100% of the time. And it’s very simple. So let’s say Steve, I’m calling you, you’re the head honcho of a fortune 500 company, I’ll say — and your assistant answers. I’ll say, hi, this is Victor Cheng calling for Steve. And then she’ll say, or he’ll say, so what is this regarding? I’ll say, oh, I’m returning his phone call. That’s my script. And it has to be true. So the trick, what I do is I get people to call me first. And then I call them back and I get a meeting or a phone call every time. Steve: Okay, elaborate please, how do you get them to call you first? Yes. Victor: Sure, that’s where the content comes in. So, when you put content out there, then it resonates with people and take an intrigue, and you give them some way to come out and reach out to you. So content marketing in it’s early for was writing a book, right? If you wrote a book on a business topic, it was a New York Times bestseller, fortune 500 CEOs will reach out to you, they want to try to hire you, get you involved in some way, shape, or form. Public speakers do the same thing. People with blogs today do the same thing. You’re doing the same thing, right with the podcast, right? You’re putting on information on the topic, you’re getting known in the field around a particular idea. And when people think of that issue, that problem or topic, your name pops up. Okay. And so that’s essentially the process. It has been around for literally for probably hundreds of years, and the digital form the last 20 years, but the process has always been the same. Steve: So let me ask you this, how do you make sure that the person you want to contact has actually read your stuff? Steve: That’s actually not what I meant, how would you get someone on the Forbes top 100 to actually read your content, like in your case that story you just told was by accident, right? Victor: Yes, yes. So there’s a couple of different ways. So if it was literally someone like on the Forbes 400, or Fortune 500 CEO type person, they’re harder to reach. And I mean, the simplest strategy is write an article and then FedEx it to them and I’ve done that. Or get an article published in a magazine and then get a clipping of it, and then FedEx it to them. It helps a lot if the content is being read by someone they know, that passes along to them with a recommendation. So I will often tell my friends, oh, if you’re struggling with this issue, you got to read these three books, they’re like by far the best books on the topic. And that’s one way to get your material to the right people. You can’t always target super precisely, but you want to be in the ecosystem that they operate in. And you want to write about issues or create content around issues that they care about. And so if you’re on the right ecosystem, that’s kind of a pretty straightforward process. Steve: The reason why I was asking is I just interviewed someone, I think, a couple of months ago, and what he does, and he compiles all the emails of all these publications of people he wants to reach, including CEOs and owners. And then he creates a custom audience on Facebook, and he just bombards them with content on Facebook, Facebook ads, and Instagram ads. Victor: Or you can target by individual. Steve: Well, once you have a large enough email list, you can create a custom audience on Facebook, and then you can just target those people. Victor: Got it. I was not aware. I don’t use Facebook all that much on the targeting site. Steve: Yeah, and so yeah, that was good. I was just kind of curious if you did something similar. Victor: That’s clever. No, no, I think for me, I’m old school. I sent FedEx. Steve: Well, apparently it works. Victor: Yeah, yes, send a Fed — write a book, send it via FedEx. FedEx always gets opened. Steve: So can we talk a little bit about the content in this case that attracted that Forbes top 100 guy? Victor: Yeah, in that particular case, I actually don’t even remember the topic. I mean, this was 20 years ago, I since use the process for lots of different prospective clients. But really is you want to write or create content around a problem your target audience has, so be clear on who your target audience is, then you think about what are the top three headaches they have? And what can you do that can help them? So in your case, you have a podcast for people who are either in the process of thinking about starting a business to a hobbyist who have already started one, and they’re trying to grow it. There’s a certain set of problems and headaches people in that situation have. And similar to what you’re doing is you’re trying to find thinking the case of your podcast, people who have expertise that would be beneficial to your audience. Some cases you are the content creator, and you’re creating content for or one could create content for your audience based on what they’re struggling with. So really, it’s just like, what are your headaches and just try to find solutions. One of the favorite exercises I have that I have for my clients when they do market research, is I tell them to go to a trade show or a conference or anywhere where your prospective customers gather and then listen for complaining. And normally our society, when we hear complaining, we went the other way. I don’t, I run towards people who complain, particularly people who complain about money to solve for complaints, right? So, rich people with money, who complain a lot, those are a good customer base in general. And just listen for what they’re complaining about and take mental notes or literal notes or recordings or whatever you can do to capture that information, obviously in a legal way. And think, okay, well I can solve that problem, I can solve that problem. Oh, that’s another problem. That’s interesting. I could solve that with either a product or a service or with information, or knowledge or expertise. And that’s a great way to start a business is you find some with a headache who’s willing to pay money to solve the headache? And then you become like this Tylenol for that particular problem. Steve: Can we talk about CaseInterview.com? Is that how you got started with that? Victor: It is in a roundabout way. I did create content around the case interview. For those who aren’t familiar with it, the case interview is an interview process used by management consulting firms like McKinsey, Bain or Boston Consulting Group. And it’s a hypothetical situation interview, so a case study type interview. And so that was very unusual. Most employers, most industries don’t use that particular approach particularly when I started the site. And I went out to Harvard to do a one day a lecture on that, I recorded it, I put it up on YouTube and put all the videos on this one page website called CaseInterview.com. And then I kind of I wanted to teach the topic, I kind of did it and I kind of let it sit there. And I kind of left and forgot about it for a couple of years until three years later, my web host contacts me saying they’re shutting down my account because my web server keeps crashing due to the amount of traffic it was getting. And I’m like, but my regular websites at the time, my corporate website, there’s no traffic, not a lot of traffic, right, it’s nowhere close to crashing the server. And then I went, I checked on my log files related to this project that had CaseInterview.com from three years ago, it was sitting on the server this whole time, but we forgot about it. That was just generating tens of thousands at the time visitors for the billing period. And it would crash the account, I had to upgrade. And then fast forward about, I don’t know, eight or 10 years, it’s millions of people, over a million people a year who read my work on that set. Steve: So it’s just completely by accident. And were people just finding you from Google, or was it referrals or? Victor: It was a lot of word of mouth. So what happened is people — I think like 10 people that first month found the site, however, they found it, and they used the material and then they got job offers. And for consulting, for the consulting industry, coming out of undergrad these days, if you got a job offer from one of the top firms, it would usually be about 90,000, $200,000 for someone who is 21 years old. These are big deal job offers, and they would get it. And then a year later, a lot of their friends who were a year behind them in school at places like Harvard and Stanford would say, hey, I want to pass this case interview thing. How did you do that? And they said, oh, there’s this guy named Victor Cheng, he has a website called CaseInterview.com and there’s like six hours of free tutorials that are on the homepage. And I just followed the videos, and I just did what he did. And now I have a six figure job offer. And like really, like yeah, it worked. And so they go ask multiple people, multiple mentioned my name. So then that year, twice as many people would get job offers, because there were now twice many people who were aware of it. Then the following year, it just sort of grew exponentially. So every year, people would ask the people ahead of them in school, hey, what are the good resources? And then now to the point where in about 100 countries around the world, probably 80 to 90% of all the new hires of McKinsey, Bain and BCG, these are the top consulting firms, their recruitment, I believe 80, 90% of them are people I’ve taught one way or another. Steve: No way. That’s crazy. How do you make money doing this, then? Are you selling the materials now? Steve: So people are getting jobs with your free content, I’m kind of curious how you separate out the premium from the free, like what does the premium stuff look like? Victor: So the premium stuff would be, so for example, the free version is 8 hour, 6, 7, 8 hour tutorial on how to pass the case interview. A premium version would be 24 hours of actual interviews being recorded with play by play analysis by me on what particular candidate is doing well, and what they’re doing incorrectly and how they could have turned around performance with reenacting what a better answer or a part of the answer would sound like. So, this is two different versions. Steve: Is there is a one on one instruction that you provide, is that like personal instruction? Victor: Yeah, we do that. So I have a staff of — a team of former interviewers from the top firms. And I think have delivered 9,000, almost 10,000 individual one on one Skype based practice interviews since about the year 2011. So we have the largest case interview coaching organization that I’m familiar with in the world, particularly on a particular, one particular approach, the case interview so a unified approach. Yeah, and so that’s been in over 60 countries, I think over that time period, as well. Victor: And I just want to emphasize to the readers out there, just head on over to CaseInterview.com. I’m not saying this to be mean but it’s not like a beautiful site but the content is fantastic, to the point where I literally spent several hours last night reading his posts, and I actually want to get into some of those in a little bit. But I’m just kind of curious, Victor, like how you — it sounds like you kind of stumbled upon this by accident, right? Victor: Yeah, I think I’ve been trying lots of different things over the years. But I think the one thing I — this particular project worked out usually well, and that was a bit by accident, but I was prepared for it too. I did my part in terms of being prepared. Steve: So if you were to be more deliberate about this today, how would you kind of redo CaseInterview.com? Would you do it the same way? Victor: I would actually yeah. So I think there is a lot of value in — and it’s written — I back up, it’s very counterintuitive, because this does not work well in the offline world. But it works really well in the online world. Giving stuff away for free works really well as a marketing strategy. It works for crack cocaine dealers, right? The first it’s free. It works for Mrs. Fields cookies, right? The first bite is free. But if you want the rest of the cookie, you got to buy it. It works for enterprise software that cost a million dollars, they give it away to college kids, college students to learn programming, and then when they get out in the workforce, then you have to pay a million dollars for the company and employer to buy the software. So free, is by far the single best strategy for marketing when you have a good product, when the product is exceptional, giving it away as a free sample works really well. If the product isn’t good, then it doesn’t work very well. So I’ve always been very interested in creating things that were exceptional in everything that I do, but from a traditional marketing standpoint, if I say, hey, Steve, my product is exceptional, you’re not going to believe me, right? Steve: Well, I would try to believe you. Victor: You would well, yeah. If you didn’t know me, you would say, oh, well, doesn’t everyone say their product was awesome. And then it’s very hard to tell. And it creates a lot of risk for the consumer or the customer. So when you give things away for free, take away a lot of the risk. So I would probably start a business or a project, particularly with more expertise based around giving away content for free. Steve: Which is an actual case study because I know you told me earlier that you started a new site called Firsttimeceo.com. Victor: Yeah, yeah. So I am expanding the executive coaching portion of my business. And I work with a number of insider type CEOs, companies who are over a million in sales growing at least 50% per year, year over year and have, I think at this point, made six clients over the past couple years who made the Inc. 500 or Inc. 5,000 list. So I’m starting a new project called FirsttimeCEO.com. It is a brand new site really geared towards trying to draw more people who are in that demographic into my universe. And so what I’ve done, I literally did this yesterday, is I took a lot of content I had sort of in my archive server and the server of almost everything I’ve written over the many, many years. And I found a couple of pieces of content that would really click with, resonate well with someone who’s building that kind of multimillion dollar business, and put it up on the site. And that’s the same process I used to start CaseInterview.com years ago. Those will ultimately be videos because it’s a more visual world these days than maybe a decade ago, and convert some of into slideshow, so lots of different formats to be consumed. But the general idea is to give away free stuff, get known to a particular audience, use something called permission marketing, which Seth Godin talks a lot about that. It’s as a great strategy to build a relationship. And then there’s many, many options, what you can do with that either from a monetization standpoint, or just getting known in a particular field. But that’s kind of the overall approach, it works very well. Steve: What is your strategy for disseminating that information? Like right now, I just went to the site, and there’s a bunch of content on there. How are you getting the word out about it? Victor: Yeah, well, since the site was only 20 hours old [overlapping 00:24:07]. Steve: It’s like a case study, right? Victor: Yeah, totally. It’s a case study. So here’s the blueprint if you will, and I’ve done parts of much of this myself, and I would absolutely have no hesitation to repeat the process. So you get all the content up there first, you want to get at the summit into multiple channels, if you can. So it’s video which would be on your site, and it should be on YouTube. If it’s audio content, it should be like in iTunes, all the podcasts players, and also on your site as well. So the first that content has to be accessible. Once it’s accessible, it has to be good. And when it’s good, what you get is word of mouth. So you get one person on there who sees the article and says this is amazing. And then they email it to like two other people. And then you get this exponential growth curve, right? Every visitor who comes tells two other people about it at some point for the next couple of months, that is a sign of good content. So that gives you the ongoing growth, when the content is good enough to get to trigger word of mouth. And then to sort of get the ball rolling, there’s a couple of options that come to mind. One is if you already have a mailing list, you just sort of let people know in the mailing list. Or if you have a social media following, you post it and say, hey, there’s a new content I produced that might be of interest to you and here it is. If you don’t have that at all, and you’re starting from scratch, then the other way to get traffic really to your content is to participate on other people’s either social media or blog presences. So it is going to someone else who say is better known in your field, if they have a blog, and commenting on the articles, and contributing in some value added way, like be helpful and add comments, add examples, add links to resources, be helpful in your community. And particularly in the digital world, when you’re helpful to one person, there’s like 10,000 other people who are witnessing the process, right. And a couple of things that happen in that particular approach, you get known by the bloggers, bloggers we know, we read the comments on our blogs. And when people write something really interesting, we tend to notice, particularly if that happens more than once. And it can build a relationship with that particular blogger. Writing guest content on other people’s sites is probably one of the best strategies for getting content known, getting your own content recognized because you can link back to that. That’s essentially what I’m doing right now Steve, other than the fact that I like you, which I forgot to mention on our pre conversation. Right now I’m getting – I’m exposing your audience to my work, right? They may know who I am. And I’ve mentioned my website more than one time Firsttimeceo.com, and that’s spelled either way, numerically or alphabetically. And some of the people who are listening in are going to come and check out Firsttimeceo.com, and they will see some of the content, some of them will really like it a lot. They may tell their friends, they may sign up to receive more information from me. And then that process is, basically that’s the whole process I’m talking about in a nutshell. Steve: I just wanted to take a moment to tell you about a free resource that I offer on my website that you may not be aware of. If you are interested in starting your own online store, I put together a comprehensive six day mini course on how to get started in e-commerce that you should all check out. It contains both video and text based tutorials that go over the entire process of finding products to sell all the way to getting your first sales online. Now, this course is free and can be obtained at Mywifequitherjob.com/free. Just sign up right there on the front page via email and I’ll send you the course right away. Once again that’s my Mywifequitherjob.com/free. Now back to the show. So let’s switch gears a little bit and talk about some of the content because I did read like 250 posts, and I actually enjoyed a bunch of those posts that were relevant to me. One of those was how to win any argument. I don’t know if you remember some of these posts, but it had to do with a way that you kind of approach arguing with somebody, not necessarily to — you’re not trying to shut them down, but you’re trying to kind of influence them to see your point of view. I don’t know if you remember this post, but I’d love for you to go into a little bit more depth on it. Victor: Sure. I think one of the easiest ways to be influential to somebody and have them hear your words and really receive them well is to listen to them first. And one of the great ways you can confirm that you heard them is when you first speak, you speak back what they’ve already said and believe to be true. So if you and I are arguing about something, and it doesn’t really matter what the topic is, and I really want to convince you to my way of thinking, when I respond to whatever you say, I will not begin with what I think. I will begin with what you think and feel very strongly about. So, I’ll say something like, Steve, it sounds like what you’re saying is — and then I’ll make your argument for you, that you just told me. And I’m going to argue your point of view so passionately, so articulately, so clearly, so well-reasoned and stated that you’ll be nodding your head like well, yeah, totally. All I’m doing is I’m repeating back what you told me, but perhaps in a maybe hopefully a bit more clearer kind of way. So that opens the door to the other person listening, because the beginning of the conversation is their own words. Steve: Even if you don’t agree with it. Victor: Even if you don’t agree with it. Yeah. You don’t have to say you agree with it. Easier to say, I heard what you’re saying is, pick some controversial topic, I hear you saying is that this is the case and for these reasons, and this is why you feel so strongly about that. Steve, did I hear you right? Is that what I heard you correctly saying? And then if you did a good job, and sort of actually paraphrasing what they said, they’re going to be number one paying a lot of attention because people in an argument are expecting a fight. They’re expecting you to disagree with them. So it’s very disarming when you can repeat back what they said, and particularly very clearly. Steve: So [overlapping 00:30:09] basically the argument for them. Victor: Yeah, you summarize their argument for them better than they could have said it themselves. Then suddenly they’re quiet because what do they need to say, you’ve already said everything they’ve just said and you said it really well, and really clearly and very convincingly? So that’s the opening of this kind of approach to influence. And then suddenly, they’re paying attention. And then they’re very open-minded. And so what you want to do though then is you then want to say, what you just talked about, I think really, it really clicks with me, I see what you’re talking about. But I think there’s one area that I think – I think you’re mostly right, it’s the phrase I often use, I think you’re mostly right, but there is one little piece that I’m just not quite sure about. I think I have a slightly different point of view on that. And sometimes I’ll ask, particularly if they’re more senior person in a position of authority, would you be open and interested in hearing this other different point of view? So I use the word different a lot. I never say you’re right or wrong, because right or wrong implies that someone has to win, right? And so what I often do, particularly as I’m often talking to people with more power than me, I often ask for permission, are you open to hearing something, a different point of view? Not are you open to hearing how you’re wrong? Not do you want to hear why I’m right. I’ll phrase it specifically as are you open to hearing a different point of view, or a different perspective, or a different opinion on that particular issue? Steve: it’s a very humble way it seems of arguing, right? Victor: it is, and here’s why it works, because most argument occurs at two levels. One is at the actual logic of the argument, and the other is at an emotional level. And most emotional arguments usually have some element of power dynamics involved. So if it’s husband and wife, it’s who’s got more power in the marriage, right? If it’s between two peers in a corporation, it’s who’s going to be next in line to be CEO. So underlying a lot of arguments is a power dynamic, right. And so this is why you’ll see like a lot of corporate politics gets a bad name, is because people are using the company issues as a way to jockey for power, and sort of dominate one person over the other. So when you have a more humble approach, you’re saying that I’m not disputing the power differential hierarchy here. So, if I’m a junior person, I’m not going to challenge the CEO and say you stink as a CEO because you’re wrong. I’m going to acknowledge the CEO’s power by saying; do I have your permission to share another idea? Would you be open to hearing a different point of view? That question has a couple of things baked into it. Number one, is it says, the only person in this relationship that can decide whether I speak is you Mr. or Miss CEO? Okay. That’s why I’m asking. I don’t have the authority to tell you what to do but I only have the authority to ask you if you’re interested in hearing, so I’m asking for permission, and you only ask for permission, when the other person has more power. So it’s a very humble way of acknowledging that they have the power and not trying to challenge it. When you say words, like I have a different point of view, then you’re not saying they’re wrong, right? People in power don’t like to be told they’re wrong. People in marriages don’t like to be told their wrongs. Steve: I was going to say, this is like marital advice here. Victor: It’s the same down there. The CEO is in the boardroom one day and in the bedroom at night, right? So husband, wife, it doesn’t matter. It’s all about people. Same thing with kids, no one likes to be told what to do. And no one likes to be told that they’re wrong. So you never say that, and it’s very disarming. And then they let their guard down because they know the argument is not about power based combat, it is actually hearing the ideas. So a lot that’s very subtle. I learned this sort of in the corporate world, dealing with people who were literally 40 years older than me, having 40 years of experience when I had like one year of work experience and influencing someone who runs a billion dollar company when I’m 22, you don’t have a lot of power, right? So it’s very differential, but yet still hold from [inaudible 00:34:08]. Steve: So along those same lines, I really enjoyed your posts on how to kind of present yourself to be taken seriously by others. And I believe you used the term gravitas, right? So first of all, define what that is, and what is your way of getting people to listen to you even though you might be really low on the totem pole. Victor: Yeah, so gravitas is sort of a Latin phrase that really means executive presence. So one of the challenges in the corporate world is sometimes the person with the best idea is not the one that gets paid attention to. Often it’s the person with the most seniority; they get paid attention to even if their ideas are terrible. And oftentimes, the smartest person in the room is the one that’s getting ignored, or the most knowledgeable person in the room is getting ignored. So executive presence is about how you present and how you create a context so that your ideas get taken more seriously. And there are a couple of strategies for doing that. A very simple way, two or three simple strategies, number one is to know your material. So if you are not competent in your stated area of expertise, you don’t deserve any executive presence. So that’s the first things, you have to know your material core. And that’s just the entry point. But to get taken more seriously, there is a couple things you can do, two strategies in particular that come to mind. One is to, particularly if it’s within a company for example is to build relationships with the people that are in their audience, and building those relationships offline. So if there’s a big presentation, or a big decision meeting, oftentimes, the person with gravitas or executive presence has invested in the relationships with the key people who are in the room. So much like I talked about earlier about getting to know somebody else’s point of view and position, when you already know what everyone else is already thinking and they know that you’ve taken the effort to learn from them, they are far more open to hearing your ideas because you heard their ideas first. And so, I have a friend of mine who recently got promoted to Chief Financial Officer of a company and it’s her first CFO position. She knows the finance side of things core, they have been doing it for a very long time. But her question to me was, what do I need to know as an executive? I’ve never been a C level officer before it. And I told her this exact same thing is get to build relationships with every person, know every functional areas, key issues and concerns and how they see the business and what they’re concerned about, and be able to argue all their issues, and all their perspectives and know them so well that you could argue their departments needs more eloquently than they can. When you do that, then you go put that in your financial plan as a CFO, they’re going to listen, because they have confidence that you’ve already listened to them. So, one way to get taken seriously is take others seriously first before like a big thing. So that’s sort of one strategy. Steve: How does that translate to the online world by the way? Victor: To the online world, I would say it would be if you are trying to build a relationship with someone like a blogger or a YouTuber, someone with a lot of influence, one of the things that works really well is when you’ve read all the material, and you ask them intelligent questions that aren’t already on their blog or YouTube channel. So Steve, you done your homework, you read my articles, you’re mentioning things that — apparently something I forgot I wrote, like, oh, shoot, okay, Steve’s done his homework, right? Like respect to you, you put in your effort to build a relationship here, or extend our existing relationship and that means something. I mean, I get like thousands and tens of thousands of email requests all the time. And the ones I dislike the most are the ones where, hey, I want this, I want a job that pays $200,000 a year. Where do I start? I wrote like 700 articles, there’s 1.5 million words I wrote on that topic. And the person hasn’t gone to Google; they haven’t gone to my site. They haven’t gone to YouTube, they haven’t read my books and they want me to do all their work for them. So those are kind of like, I’m not the human Google, right. The questions I appreciate are, I read your book, I read every article, I looked through all the videos, but there’s one issue I still stuck with that I can’t seem to figure out. I’m not sure I’ve missed it. But what do you think about this? And then I’ll go shoot? No, I actually never answered that question. That was a really good question. They did their homework and they’re asking for help. And then I’m happy to help because they’ve done their part, they met me more than halfway. So with building a relationship it’s know their work first, don’t ask questions that you can find the answer to about them on Google, read their LinkedIn profile, read the last blog post, read the last thing, a social media post, kind of do the basics. And unfortunately, people don’t want to do that. Steve: Since we’re talking about relationships, one thing that I found extremely provocative about your blog post was your notion of EQ versus IQ. And we’re both Asian here, right? Steve: We emphasize a lot on I guess book learning and intelligence. But it seems like in the real world, the relationship aspect, and what you call the emotional intelligence quotient is a lot more important. And if you wouldn’t mind, just kind of define those two terms first, and what you mean by that. Victor: So IQ would be what we would traditionally think of someone who is smart, right? Gets good grades, can do math, that kind of thing. So IQ test is where that term comes from. And emotional intelligence would be more around someone’s emotional savvy at relationships and interacting with other people. And the reason why EQ tends — and there is research on this why EQ tends to be responsible for greater levels of success is because most senior roles either within a corporation or when you’re an entrepreneur and you have people working for you, as you progress in your career to greater levels of responsibility, usually, the people doing the work are people who work for you, not yourself. So I would say IQ is very important in your sort of first job if you would, because you’re like an individual contributor, like doing work individually. But as you progress to a manager, or director or VP, or founder or CEO, or business owner, then quite often, if you look at the amount of work being done in the company, you’re actually doing very little of it yourself. And you’re managing or leading others to doing. So the ability to work with other people becomes more important. So a new engineer has to be good at engineering, the VP of engineering doesn’t have to be good at engineering. The VP of engineering has to be good at managing people who are very good at engineering and is a different skill set. So EQ is about building those relationships and being very effective and managing relationships to reach your particular objectives. And so my big take, and this is especially the case because I’m Asian American is the culture I grew up on. Really overly, I think my opinion overly emphasize IQ, probably to a fault. There’s value even in that, but there’s a limitation to it too. And in my experience happiness in life, a successful career at some point transitions over to having EQ being more important. So that’s kind of my take in terms of definitions and why I think it’s so important. Steve: And in terms of business, at least to me, it seems like EQ is way more important than IQ. Victor: I would agree because in a business to survive, you need clients, or customers and buyers. And a lot of EQ is about understanding the world from their point of view. So when I visit a website, I am able at this point to try to imagine what it feels like for that particular customer when they see a website or when they see a product or a service. So one of the things I asked you for example when preparing for our call today, or our podcast call was like, hey, Steve, who’s the audience, who is this going out to? And you kind of give me your description, I have a mental picture of who they are, what they might likely care about. I’ve been in many of those positions before and it’s been a while and I can try to put myself from that vantage point. And a lot of what I’m saying is geared towards my picture of who that person is and what they might care most about. And so that’s an EQ skill, putting yourself in someone else’s shoes. And that’s super important in business from a sales standpoint, how you convince somebody, a marketing standpoint in terms of what words to use, what messages will resonate with them. From a product design standpoint, from a personal brand building standpoint, it’s seeing things from the other person’s point of view, like that’s one of many EQ skills that’s very vital in business. Steve: So the question is, how do you develop these skills? Victor: So the EQ development comes from a couple of different places, the foundational elements of EQ starts with being emotionally self-aware and here’s why. In order to recognize feelings that other people have and that’s coming across to you, the only way to recognize for example, if someone’s irritated at you, is when you recognize when you’re [inaudible 00:43:11] at somebody else, and you remember what it felt like, and you remember the behaviors you did, right? So if I’m irritated, I might cross my arms, I might squash my face kind of like I’m kind of irritated kind of look, my voice might change. I might say things like fine. The word fine literally means okay, right? So Steve, you asked me, hey, is it okay if we extend our podcast another two hours? I might say, fine. So the word says yes. But you laughed because my voice intonation and I can tell you have very high EQ. I’m not really saying fine, right? I’m not saying okay. My nonverbal say I’m not okay but my verbal says okay. And you laughed because you picked up I’m different, I kind of exaggerated a little, sometimes it’s more subtle. And so the ability for you to recognize that I was not really being honest about my feelings was because you recognized the feeling, right? You’ve sensed frustration in my voice, you sensed sarcasm, you sensed many little things that tell you that there’s an incongruence between what I said and what I meant. And the only way you can do that and see that in others is if you recognize it in yourself, right. And it doesn’t mean you have to do the behaviors, but it means you have to have the impulse too, and you recognize the feeling, maybe wanting to say okay, because it’s not polite thing to do. But really feeling like I don’t really want to, and I’m feeling a little conflicted. And I just expressed that conflict in a sort of a passive aggressive way. And you picked up on that because you had that awareness. So EQ starts at home if you would with yourself. And one of the exercises I have people do when they’re trying to build up their EQ skills is to set an alarm on their phone for every hour, and there’s some apps that will do that and just ask yourself every hour, how are you feeling? Because if you can check in with yourself to see how you’re feeling, you can get better at noticing how other people feel as well. Steve: So it sounds like to just kind of summarize what you said, just being a little bit more deliberate about recognizing how you feel based on the actions that have taken place and being able to relate that to others. Victor: Yeah, yeah, very much so. And I think you can notice it and others and then when you can notice feelings and emotions in yourself, you can notice in others. And then you can put those feelings and emotions on the table in terms of a conversation with others. And so a simple example, that would be like empathy, right? So you hear that word used a lot. And the empathy is really about if you’re having a rough day, I might notice that because I’ve had rough days before and I kind of see similar signs. How am I saying that Steve? It sounds like you’re having like a really rough day. And that’s like empathy. And the reason I can be empathetic is because I too, have had bad days. And I remember what it felt like, even though your bad day is quite different than my bad days, at least in the past, the feeling is awfully similar, right. And so it’s interesting, as I’ve traveled around the world, meet lots of different kinds of people, the heat, the surface level experience we have are quite different, but the human emotional experience is quite similar across cultures and across time. So when some person in some far flung third world country loses a child to death, that child gets killed, I don’t know that person’s role. I don’t know the culture, I don’t know the language. I mean, I can be able to communicate with them in any common language, but the feeling of loss, like I felt loss in my life, right. And I can just – I can experience that, I could share that feeling, and my heart can break because I’ve felt loss and I recognize when someone else feels loss. That’s an example of being empathetic. And so all this builds, starting with yourself, noticing your feelings, noticing other people’s feelings, and then making the feelings being a part of the conversation. And the way that relates to businesses, because most people who make any kind of decision, personal or professional are doing things for two reasons. One is like the intellectual reason, like I need a new car, because the old one is broken, that’s an intellectual reason. And then there’s an underlying emotional reason that often does not get expressed verbally. The real reason I want that Ferrari is because I’m middle aged and feeling poor about myself and I want to look good, right. And I may not admit that publicly, because it’s kind of embarrassing, but I really want the Ferrari comfortable kind of thing. And so when you sell or when you work with employees, there’s always the stated reason, that’s usually intellectual, logical, factual, reasonable. And then there’s the emotional reason. And so when you can get some insight into the emotional reason, and then you address people’s emotional needs, you’re far more influential. So a simple example is the person might not want to buy your service because they’re really afraid that if they buy it, they might get fired if your product or service fails. They might not ever say that, but they’re going to say, no, it’s the deal. They’ll invent some kind of reason of like, your price is too high or whatever, some kind of reasonable complaint about your offering. But really, the underlying reason they’re not buying is they’re scared. It’s their fear. So if you have high EQ, you might pick up on the fear, and try to find some sort of face saving way to address that fear without calling them a scared cat, because that’s kind of offensive. So that subtlety is what allows, for example, very large deals like multimillion dollar deals, the one to 7 million in sales for one transaction. Those deals, a lot of it is driven by emotion, but it’s often never stated out loud this undercurrent, and people with high EQ can pick up on that, can pick up on opportunities, those with only high IQ, don’t ever even see. Steve: That actually reminds me of when I used to work, people would come to try to sell us their software. And oftentimes our decision came down to who we liked better in terms of who is going to support us? Victor: Absolutely. That is right. Over a million dollars in particular, you’re buying the salesperson. Yeah, you trust them to take care of you after they get the deal. And that is very, very right, you’re not you’re not alone in that. Steve: So Victor, I would love to talk to you for two hours more, but you said fine. So I’m afraid, I’m going to go ahead and let you go. But I do want to mention your new site, First Time CEO, are you going to be talking about these things on that side as well, because I find this customer or human psychology element very interesting? Victor: Yeah. Yeah. So First Time CEO, again, is geared towards people who are growing a bigger business, generally over a million dollars in sales, growing 50% a year or more. And I talk about sort of the technical aspects of scaling growth, as well as the human interactions pieces, right. So leading a team, working through others rather than doing it yourself, all these factors become important and that’s something I’ll be covering on that site as well. Steve: Cool. And the site is up. I’m actually on it right now. And there’s actually a number of good articles on there already that I encourage everyone to go check out. So Victor, thanks a lot for coming on the show. Really appreciate your time. Victor: Thanks for having me, appreciated. Steve: Hope you enjoyed that episode. My conversation with Victor really made me think about what makes a person successful in life, and how anyone can take their knowledge and monetize it. For more information about this episode, go to Mywifequitherjob.com/episode250. And once again, I want to thank Privy for sponsoring this episode. Privy is the email capture provider that I personally use to turn visitors into email subscribers. They offer email capture, exit intent, and site targeting tools to make it super simple as well. And I like Privy because it’s so powerful and you can basically trigger custom pop-ups for any primer that is closely tied to your ecommerce store. Now, if you want to give it a try, it is free. So, head on over to Privy.com/Steve, once again, that’s P-R-I-V-Y.com/Steve. I also want to thank Klaviyo which is my email marketing platform of choice for ecommerce merchants. You can easily put together automated flows like an abandoned cart sequence, a post-purchase flow, a win-back campaign, and basically all these sequences that will make you money on autopilot. So head on over to Mywifequitherjob.com/K-L-A-V-I-Y-O, once again that’s Mywifequitherjob.com/K-L-A-V-I-Y-O. Now I talk about how I use these tools on my blog, and if you’re interested in starting your own e-commerce store, head on over to mywifequitherjob.com and sign up for my free six-day mini course. Just type in your email and I’ll send you the course right away. Thanks for listening. This episode started out slow, but between the 20 and 50 minute marks, became one of the most important podcasts that Steve has done, especially for those of us who are a bit too rational for our own good.